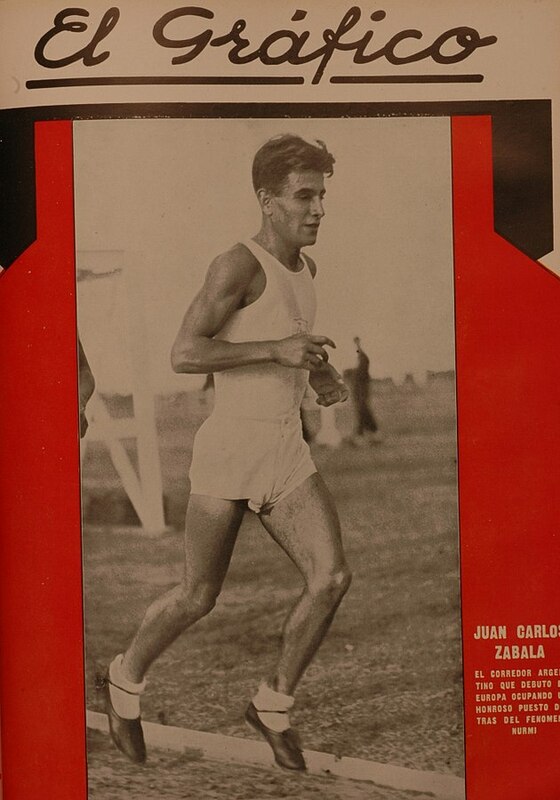 “In spirit, in heart, and in endurance, Juan C. Zabala, a slim young son of Argentina, was the modern reincarnation of Pheidippides of old”. 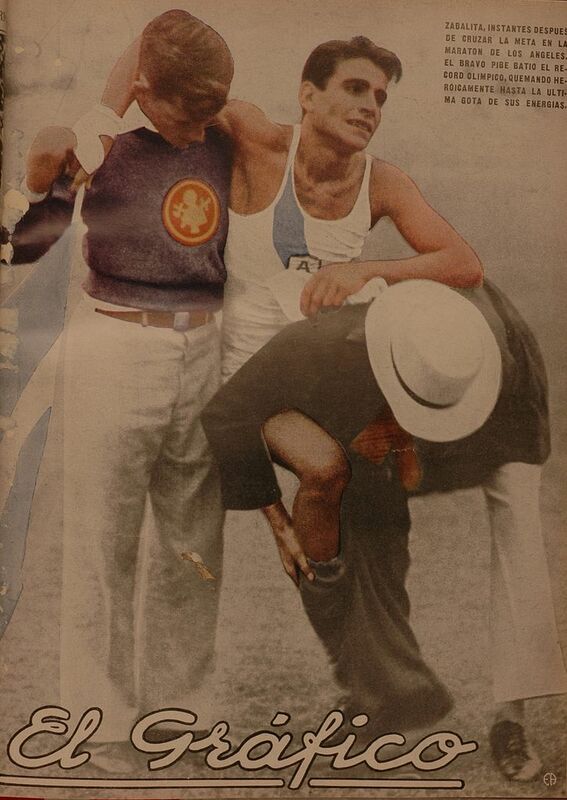 Los Angeles Examiner, after his Olympic victory. Los Angeles was selected as the Olympic host of the 1932 meeting, as it was the only city candidate. Celebrated during the Great Depression the number of athletes in these Games was smaller than in Stockholm 1928. It was the first time an Olympic village was built to allocate the athletes (only the males, as females were distributed among hotels in the city), and the first time a podium was used to give the medals. Early on 1932 the great favourite for the marathon was the Finnish Paavo Nurmi, even when he had never completed a full marathon. In the Finnish trials he retired after 40k, having managed an astonishing time of 2 hours and 22 minutes. Having travelled to Los Angeles, he was excluded by the IAAF three days before the Olympics for violating the amateur rules after receiving some money in one of his running tours. With Nurmi out of the scope, and no clear favourite, British Sam Ferris and Duncan McLeod, and Finnish trial winner Armas Toivonen, looked as the top contenders for the marathon victory. 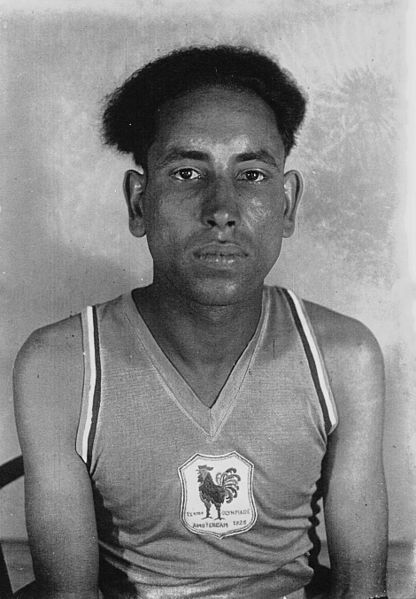 Juan Carlos Zabala, nicknamed the “Ñandu criollo”, was born in 1912. Orphan since very young his childhood was not easy, growing in an orphanage. He started running early, and among other victories in shorter distances, he had already won the Kosice marathon in 1931 and competed in two of the North-American trials, after moving to the United States to acclimate for the Olympics. 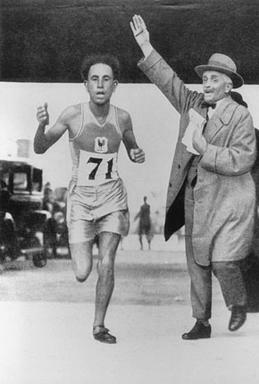 At the time it was illegal to compete in the Olympic marathon to athletes younger than 20, so the Chilean president allowed him to change his date of birth to 1911 to compete in Los Angeles. Race started on August 7th at 15.38, with 29 runners from 15 countries. Argentina, Finland, Japan, Canada and the United States entered 3 athletes each. It was the marathon with less runners since the opening Games of 1896. The Olympic stadium had 80 thousand spectators to enjoy the last day of track and field events. Zabala took the lead early, being the first out of the stadium. The course toured the city, with 7 intermediate control stations that allowed spectators in the stadium know about the race development. By the second station (4.5 miles) Zabala was still in the lead, followed by the Mexican Pomposo just seconds behind him, and a group of 7 runners later. By the fourth station (14.5 miles) Zabala was still in the lead, with a 1-minute advantage over Finland´s Virtaner, and Toivonen in third place. Virtaner managed to get in the lead, although his hard effort would be pointless, as he started losing positions, retiring at 23 miles. McLeod, according to his plan of attacking in mile 20 was the leader at the sixth station (22 miles), followed by Zabala, Toivonen, and Japanese Tsuuda, one minute behind each, and Ferris in fifth place. McLeod leadership was short-lived, and by the last control station (24 miles) Zabala was again in the lead, although struggling. Ferris, still fresh, started rapidly climbing positions from behind. It looked that he would manage to close the gap and claim victory. Entering the stadium for the last lap, Zabala hold his place and managed to win the gold medal in 2.31.37, with Ferris entering just 19s behind, and Toivonen closing the medal positions a further 17s behind. McLeod would finish fourth, 29s after Toivonen, for the most contended marathon until then. Zabala became a celebrity, living in the United States for some time, and competing all over Europe. 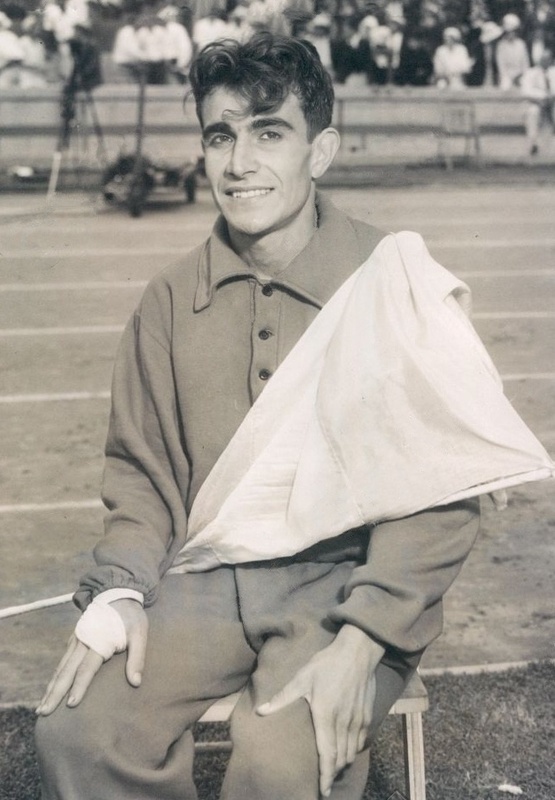 This would not be the last Olympic appearance for Zabala, as he tried to revalidate his title in Berlin four years later, having bettered the 20k world record only a few months earlier. He was the flag bearer for Argentina in the opening ceremony and managed to finish sixth in the 10000 metres. In the marathon he took an early lead again, but around the 30k abandoned the race, and retired from athletics shortly afterwards, being only 25. Zabala was an inconsistent marathon runner, as he competed in five marathons but only was able to finish the two he won. Later in his life he was accused of having Nazi links, as he was running partner of Heinrich Himmler, SS leader, while in Germany. He rejected these theories alleging that was later rejected entry in Germany because of helping some Jewish to escape to Denmark. An Argentinian movie based on his life, “Campeón a la Fuerza”, premiered in 1950. In 1980 he was named best Argentinian athlete of the century, dying in 1983. “The Olympic Marathon”, DE Martin & RWH Gynn. Human Kinetics, 2000. “We are all going to die, so we must enjoy life, not frivolously as an empty carpe diem, but grabbing every instant”. 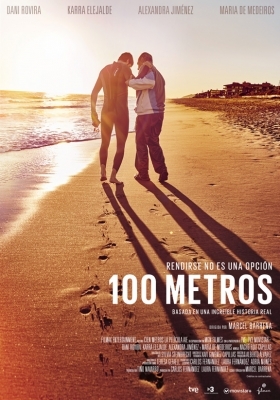 A Spanish movie based on real events, specifically the story of Ramón Arroyo, who was diagnosed with multiple sclerosis when he was 35 and managed to overcome his limitations and finish an Ironman. We find our lead happily married, with a kid and his wife pregnant with their second child. He has a successful career as publicist but starts feeling a lack of coordination in his hands. We also meet the father-in-law, a grumpy old man, alcoholic and, as we find later, weed smoker, who goes to live temporarily with the family. Feeling worse, medical tests confirm that the symptoms Ramón is experiencing are not caused by the stress, but by as sclerosis at an advanced stage. Firstly, he fights the idea of being sick, as he doesn’t feel so bad. Soon in the movie we watch his illness advancing, affecting the whole family and his job. He reluctantly starts the medical treatment, while his wife carries on with her pregnancy. We meet some interesting characters, other patients in the hospital following the same treatment he does. They don’t have much screen time, but you want to know more about their lives. One predicts him, that in one year, he will be unable to walk 100 metres. Our protagonist is left apart from his friends and we witness his arguments with his father-in-law, with whom he never got well before. It’s around then when he decides to complete an Ironman. His wife gets him and his father-in-law together, and he starts training under his tutelage (he was physical teacher in a school for 40 years), using unorthodox methods. Close to the competition day he suffers a strong attack that leaves him in badly shape. With the second child and his wife back at work, as he finally must quit his job, he manages to start training again. At this point, he is already in better terms with his father in law. He finally gets to know the reasons behind his behaviour, as he misses greatly his wife. Then we get to the Ironman’s day, with the whole family there to support his effort. He has 17 hours to complete the race: 1.5k swim + 180k cycle + 42k run. With a lot of effort, and just minutes before the deadline, with organisers already taking down the installation, he crosses the finish line among the happiness of his family waiting for him. Intercalated with the images from the movie we can also watch real footage from the real athlete finishing the Ironman. 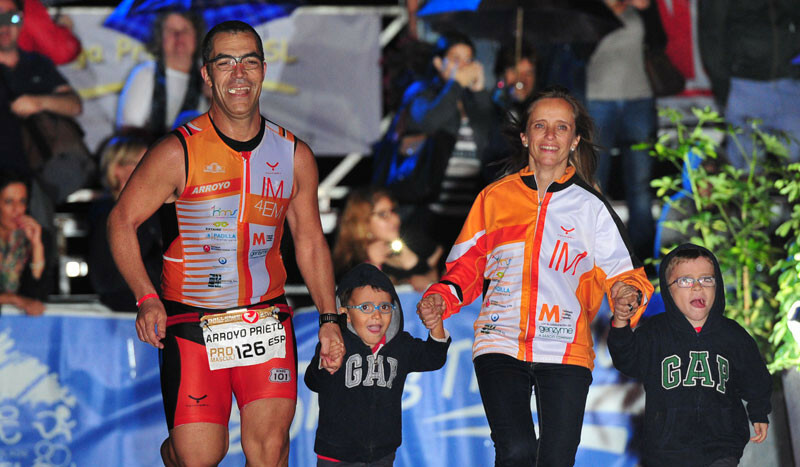 As the credits roll out, we get to know that Ramon finished an Ironman, 4 marathons, 8 Olympic triathlons, 5 half Ironmans and 16 half marathons. He was 3 years without outbreaks, but then they came back. But the story is about a man whom they told he couldn´t. The movie is dedicated to all patients suffering from incomprehension, work issues, lack of government subsidies, loneliness and depression. Pros: uplifting spirit; raise awareness about the side problems that patients suffer in his everyday life, besides the ones linked to their diseases. Cons: the father-in-law character, not very credible, and a comic-relief too intense. 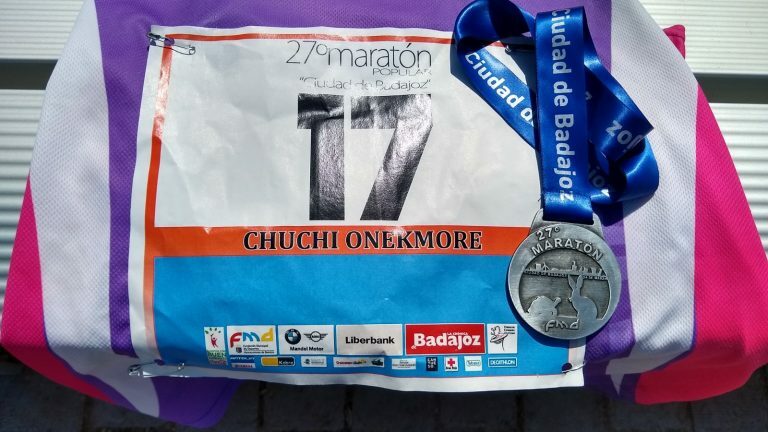 Time to get back to Badajoz, to run its marathon for a third time. As before, a good occasion to add a marathon to my tally, taking advantage of the cheap registration (15€) and interesting visiting spots in the vicinities. Arriving just before lunch, I pick my running kit, that includes a running shirt + shorts. 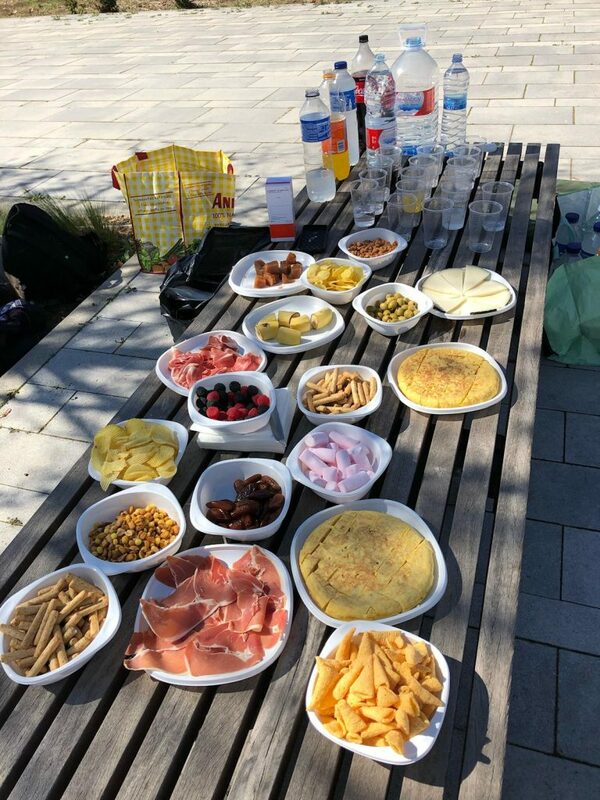 The pasta lunch is included, although we go instead to Mérida, a town located 40 miles from Badajoz, and declared World Heritage by Unesco in 1993. 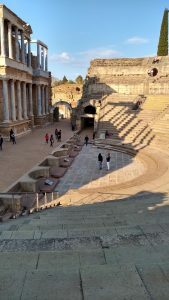 As time is at the essence, we get a 30 minutes tour in a small train to see the main sights, before visiting the unmissable Roman Theatre and Amphitheatre. After a short walk in town, and with sunset approaching we head back to Badajoz, to check in at the hotel and have a pizza before going to bed. Race starts at 9, with the half marathon starting at 9.15. With about 500 runners for each race, and pleasant weather is time to go. Last year I tagged along the 3.45 group, with an inconsistent pacer. This time around I run slightly behind the 3.30 group. As we cross the river and head towards the outskirts of Badajoz I remember that is the most boring part of the course. It is flat, and we go out and back following the same long avenue. It gets more interesting as we cross the old bridge of Palmas over the Guadiana, before turning left and surround the Alcazaba, arriving to a section with some slopes around kilometres 14-16, that promises to be hard work for the second lap. Keeping the 3.30 group in sight, I cross the half marathon in 1.45.56, three minutes faster than last year. The second lap will become a different business, as heat and tiredness start affecting my performance. My pace decays and heading back to Badajoz the 3.45 group starts closing the distance, until I get caught. The pacer encourages me to go with his small group, and although I tag with them for a couple of miles in the area with slopes, I finally fall behind in a drinking station. Luckily the worst is gone, as we get in the town centre, where public is more present and helps to get that energy, so necessary near the end, and that every runner knows well. Final time of 3.48.35 (vs. the 3.46.58 of last year), and position 256 out of 558 finishers. Third marathon of the month, and still lacking that additional punch in the second half of the race. Maybe a consequence of the training missed in January, or the competition excess in March. For April I have lined up A Coruña marathon, my debut in Galicia, and Aveiro, in Portugal, that is going to celebrate the first edition of its Maratona da Europa. Pros: cheap registration; flat course. Cons: course open to traffic (although well marshalled) and excessively out of town; considering the number of athletes a running expo, open at lunch time, would offer a warmer welcome. 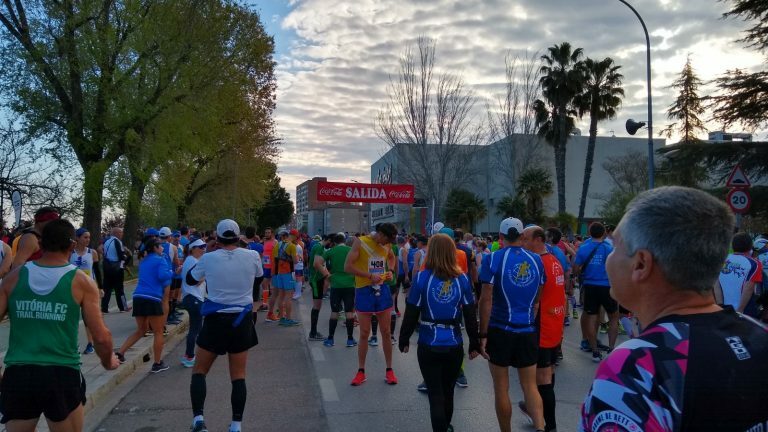 Six days apart from my Mega Challenge Marathon, and just back in Spain, is time for the Valdebebas Marathon, organised by David Paños, with invaluable help from some family members and volunteers, that is going for its second edition. It is a small field marathon (20 runners at most), where registration (20€) is by invitation. I was luckily recommended by Enrique Benito (from Calle Running). The week was full of work, with no training after Sunday´s race, and an “out of home” diet, composed mainly of nuts and fruits. The air conditioning at my workplace has also made its impact, with some cold symptoms looming close. Arriving to Madrid at midnight and managing to sleep after 3am is not the recommended procedure for a successful race. 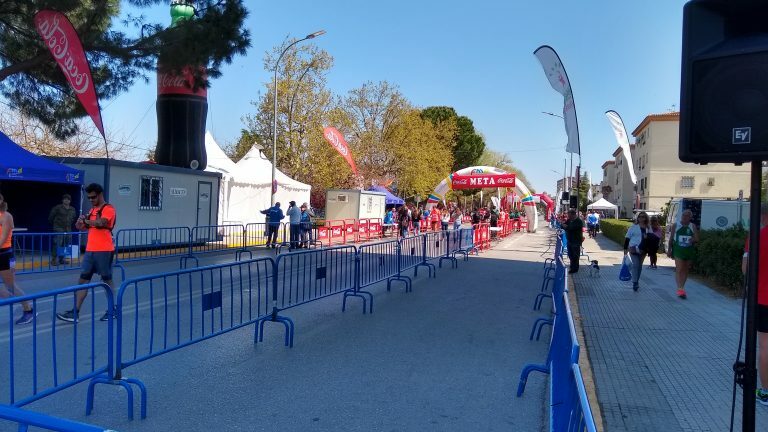 Luckily the start is at 11am, and the start area is 300 metres walking from Valdebebas train station. 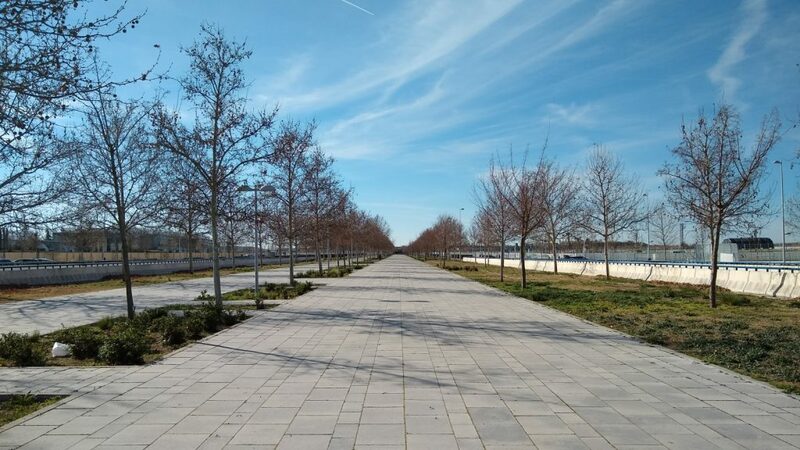 The marathon race will consist of 40 laps of a pedestrian avenue, just in front of the Real Madrid training grounds. People start gathering as the start time approaches, with some well-known faces in the amateur Spanish marathon running scene. The race is supposed to be run in a neutralised group, aiming for a 4h30minutes finish time. After a pre-race group picture with the 19 participants, and with sunny and pleasant conditions, we start the marathon. The pace is slow, as expected for the planned finish time, although I am not very good at these paces from early on. The big group gets to the first stop for supplies, and soon afterwards it splits in two. I found myself in the heading group of 7 runners, with another group of 6-7 shortly behind. The remaining runners are by themselves, or in smaller groups. As the course is out and back following the same avenue, is easy to follow everyone´s positions, although I soon get lost with the lap counting. It doesn’t take long before I lose contact with the heading group. From that point onwards, I will not feel at ease again during the race. I cross the half marathon point a bit over 2h time. It means that even I am running ahead of schedule. Already tired, I get the feeling that finishing this marathon is going to be a will effort. Front runners start lapping me. With a short course is obvious that it would happen, although the camaraderie is always present, with supporting cheers as we cross each other twice every lap. Asking other runners their laps count, help me to keep track of how many I have left. Boredom and the hard surface are not doing it easier, and I start pausing to walk every 3-4 laps, after drinking/eating at the well-stocked station. With 5 laps to go, first runners are already finishing slightly over the 4h time. At the pace I am running there is still a chance to finish under the 4.30. With less runners in the course, I don´t have any extra energy left to maintain the pace, and I finish in 4.42.59, after running an extra 200 metres, as I thought the race finished in another point of the course. Satisfied with the experience, although not with myself after last week success. Anyhow I have never been very good with races going for many laps. Pros: a marathon organised by runners for runners, where everyone feels welcomed and you go home with new friends; the supporting staff at the refreshment area, always helpful and supportive. Cons: hard surface and boring course, but impossible to do otherwise, as it was run uniquely using a pedestrian avenue; group discipline trying to achieve the planned 4.30 broke up too early on. One week of work in UK seems always as a chance to get another marathon, and I found the Mega Challenge as the most suitable race. 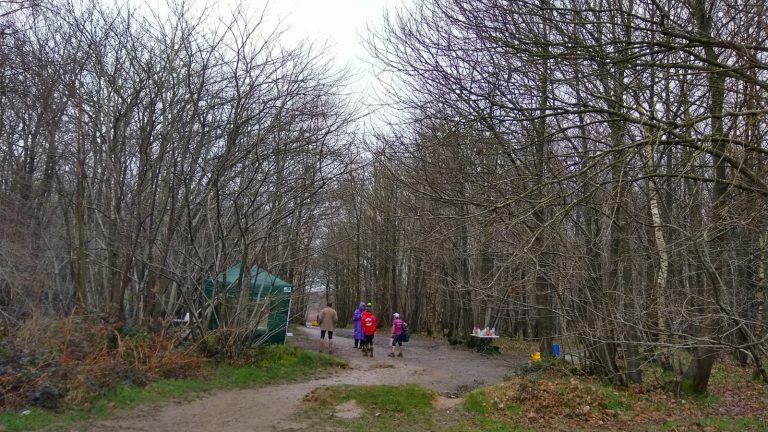 To be held in King´s Wood Park, between Ashord and Wye, in Kent, in the southwestern coast of England, is a multi-distance event. The time limit is 6 hours and is run on a 4.37-mile loop. A marathon will require 6 laps, with the medal offered to everyone running more than a half marathon (or 3 laps). Registration was priced at £39.95, with £5 going to the Park. 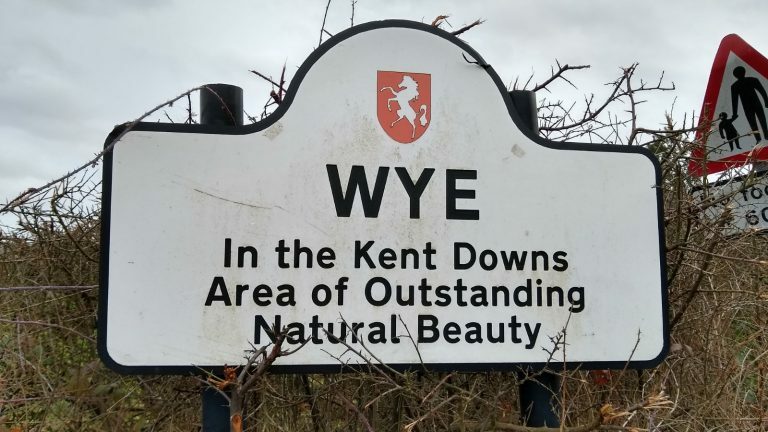 I decided to book accommodation in the small village of Wye. The morning appears cloudy, and the forecast is not promising, with rain expected as the storm Freya arrives to the area from midday accompanied of strong winds. A cab in the morning gets me to the start area, the parking lot of King´s Wood, after picking my running partner from her hotel. With 30 minutes to the start, there is really nothing to do around. Besides the parking lot, two portable toilets and the tent where organisers are covered, there is no much in the sense of facilities. I get changed between some trees, avoiding the mud covering the grounds. With no tent for keeping runners’ stuff dry, we keep our backpacks, inside a rubbish bag, under the organisers tent. Probably we were the only two participants lacking a car. A small table is facilitated to allocate participants supplies. Around 50 runners get a 9 am start. Temperature is not bad, despite the cloudy and light rain, and I go uniquely for long-sleeve t-shirt, shorts and my trail running shoes. 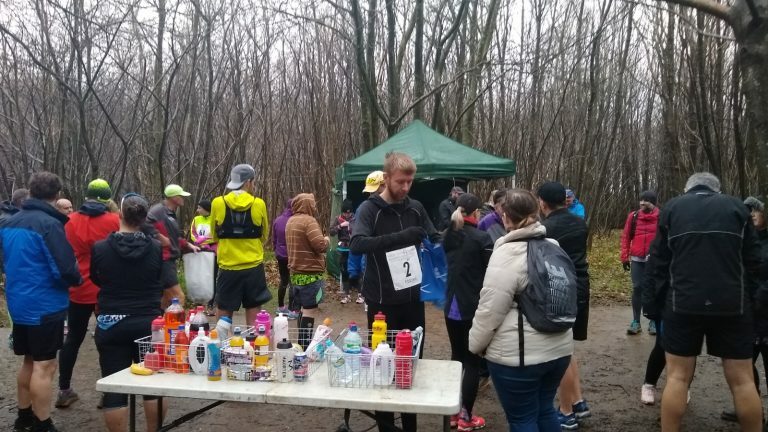 Rapidly I found that the selection of shoes was the most appropriate, as a heavily muddy section welcomes us just from the start area. Soon I realise that people are taking the run easily, as I keep the front runner in sight well into the first lap. The course is muddy in some areas, and the woods are always present, sometimes on a side of the path, and others we run through them. Course doesn´t feel boring, as flat sections intercalate with undulating ones, and two uphill slopes breaking the pace. With difficulty to know exactly who is running what distance, I found myself in the top 5 as we finish the first lap. I get my lap-counting card punched and sip my drink (testing Maurten 320 Drink mix in racing conditions), before heading rapidly back to the course. Temperature keeps constant while rain appears occasionally, as laps keep adding and I start lapping slower runners. Finishing lap 4, that somehow seemed harder, the runner in front of me finish his race after 17 miles. With only two laps to go, and feeling well, it is time for a final push. Without more energy drink, but all my gels, if there is a day to achieve something it must be today. 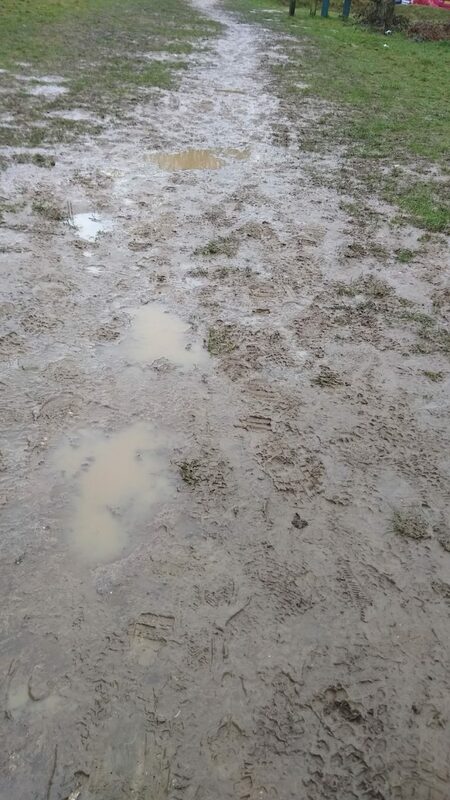 Trying to avoid a fall, as terrain has become even muddier with every lap, I am in nobody´s ground, with no notion of where the next runner in front of me is, or the nearest behind me. I reach the marathon distance in 4.21.33, and although temptation to add another lap and go for the 50k came to my mind, I touch the bell marking the end of my attempt. Luckily for me, a right decision, as I am third in finishing the marathon. A podium position without trophy, totally unusual for me. The medal and a bag with chocolates are a good reward. Because of the cold and the lack of any facility to get covered and wait for my friend (she was doing the 50k), I start walking towards Wye to get the suitcase I left at my hotel in the morning. A good 3 miles walk, downhill, with beautiful views of the Kent countryside, and a good chance to stretch my legs, as cabs were unavailable from the parking lot. UK marathon number 30, for a 75 overall. Pros: trail course in a forest area; variable distances offering runners of different levels an objective to achieve in the 6 hours limit. Cons: start area difficult to reach without a car; instead of two portable toilets, being the race in the middle of the forest, a tent could be more useful to protect the runners kit from weather conditions. Cells release small vesicles in the extracellular space, which can enter the circulation and interact with remote cells. They are called microvesicles, and when discovered it was thought that they were simply cell debris. 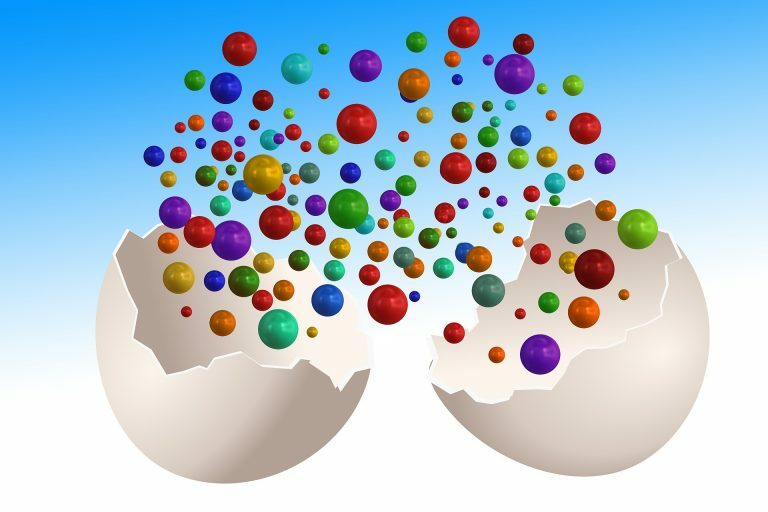 Nowadays it is known that they participate in cell communication, carrying different substances (proteins, lipids, nucleic acids) from their cell source to distant places. This communication process is known as tissue crosstalk. Circulating microvesicles differ in profile and concentration between healthy and clinical individuals, with the concentration of some microvesicles related to impaired vascular health, as it appears in obesity, type-2 diabetes and coronary artery disease. Sports is a stimuli for microvesicles release, as it was found an increase in their plasma levels in healthy individuals 90 minutes after an incremental running or cycling protocol until exhaustion. The time course shows that the release of the microvesicles starts early during the exercise, before the lactate rise of the anaerobic threshold, with values elevated often until hours in the post-exercise recovery period. The increase of microvesicles in the circulation is linked to the body activation during the exercise. They may help to dispose of cellular waste in order to maintain the homeostasis, or be signals regulating the physiological changes in response to physical activity. 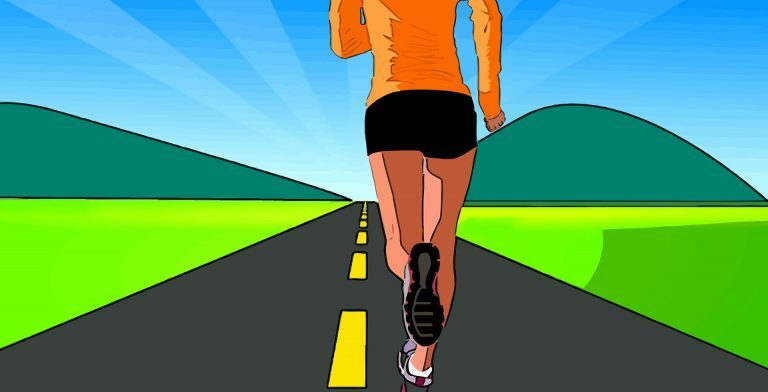 A study found a rise in the concentration of several proteins associated with microvesicles after exercise, hypothesizing that this “cargo” was transferred to recipient cells and tissues. In order to prove this transport they took plasma from exercised mice and transfused in non-exercised animals, finding a higher level of the proteins associated to the microvesicles in the liver of the transplanted rodents and probing that this organ was specifically targeted. There are many types of microvesicles that can be affected differently by the type of exercise, intensity and volume, among other factors, although it seems that exercise intensity may have a greater influence in the release. This exercise-induced release can influence remote tissues and organs by altering their cell function and morphology. Upcoming studies will need to clarify the dynamics of microvesicles release in response to exercise, and their importance in human physiology. Physical exercise induces rapid release of small extracellular vesicles into the circulation. Frühbeis C, Helmig S, Tug S, Simon P, Krämer-Albers E.
J Extracell Vesicles. 2015; 4. doi: 10.3402/jev.v4.28239. Extracellular Vesicles Provide a Means for Tissue Crosstalk during Exercise. Whitham M, Parker BL, Friedrichsen M, Hingst JR, Hjorth M, Hughes WE, Egan CL, Cron L, Watt KI, Kuchel RP, Jayasooriah N, Estevez E, Petzold T, Suter CM, Gregorevic P, Kiens B, Richter EA, James DE, Wojtaszewski JFP, Febbraio MA. Cell Metab. 2018 Jan 9; 27(1):237-251.e4. doi: 10.1016/j.cmet.2017.12.001. Exercise-Derived Microvesicles: A Review of the Literature. Wilhelm EN, Mourot L, Rakobowchuk M.
Sports Med. 2018 Sep; 48(9):2025-2039. doi: 10.1007/s40279-018-0943-z. CAFFEINE: AN ERGOGENIC AGENT IN SPORTS PERFORMANCE? onekmore 23/02/2019 21/02/2019 No Comments on CAFFEINE: AN ERGOGENIC AGENT IN SPORTS PERFORMANCE? The performing enhancement of caffeine has been known for more than a hundred years, both in endurance and high intensity activities, although its effects on maximal strength are not clear. It was banned in competition from 1984 to 2004, being nowadays widely used in sports because of its ergogenic effects. Caffeine is consumed daily by 80% of world´s population, with an average intake of 130mg/day. It is usually linked with beneficial effects on cardiovascular and metabolic disorders, cancers, neurological disorders and mortality. Among elite athletes is estimated that 74% use caffeine as ergogenic aid, especially in endurance sports. Caffeine acts as adenosine antagonist, reducing its downregulation effects on nervous activity, while increasing neurotransmitters release and muscle activation. Among its other effects it also stimulates adrenaline secretion and decreases pain perception, effects easily linked to sports performance. It is usually recommended a dosage of 3-9 mg per kilogram of weight 60 minutes before competition, with caffeine reaching the bloodstream 15 minutes after ingestion and a half-life time (time required to reach half of the concentration) of 3-4 hours. A broad meta-analysis of studies linked caffeine with a small improvement, of 2.63%, on endurance performance. There are important variations between individuals regarding performance improvement that could be linked to genetic variations among them, with some genes already identified. Gene CYP1A2 is involved in caffeine metabolization speed and ADORA2A involved in nervous system excitability. Habitual caffeine use may produce epigenetic modifications affecting its ergogenic effects. It was found that long term caffeine use increases CYP1A2 activity, the gene involved in caffeine clearance, decreasing the excitability caused by caffeine. Consequently, people with usual doses of caffeine may need higher levels to attain an ergogenic effect. There are also environmental factors affecting caffeine effects, such as smoking, dietary vegetable intake, pregnancy or training status, among others. Expectancy also affects its effects, as some athletes showed improvements in performance when they consumed placebo, but were informed that they were getting a caffeine boost, with higher doses of placebo getting better improvements. Caffeine doses higher than 9 mg/kg could be detrimental because of side effects as insomnia. Caution should also be taken in individuals with high blood pressure, as has been described increases in blood pressure after caffeine ingestion, proportional to the levels of caffeine, and increases in heart rate of 10 beats/min. As for the caffeine origin, it is usually consumed as capsules or powder dissolved in liquid (the usual coffee we are used to), although there are alternative forms such as chewing gums, bars, gels, energy drinks and aerosols, that may have different absorption rates, and are the focus of new studies about caffeine consumption and sports performance. Do you use caffeine to improve your performance? I would like to see your comments. Are the Current Guidelines on Caffeine Use in Sport Optimal for Everyone? Inter-individual Variation in Caffeine Ergogenicity, and a Move Towards Personalised Sports Nutrition. What Should We Do About Habitual Caffeine Use in Athletes? The Effect of Acute Caffeine Ingestion on Endurance Performance: A Systematic Review and Meta–Analysis. 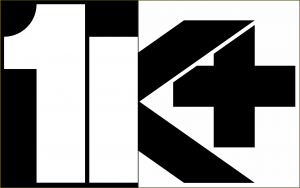 Southward K, Rutherfurd-Markwick KJ, Ali A. 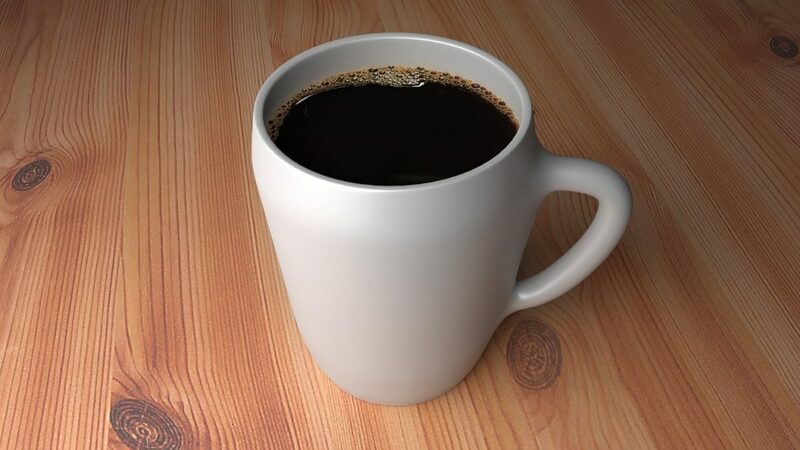 The Influence of Caffeine Supplementation on Resistance Exercise: A Review. Grgic J, Mikulic P, Schoenfeld BJ, Bishop DJ, Pedisic Z. “If you lose, you must start afresh”. 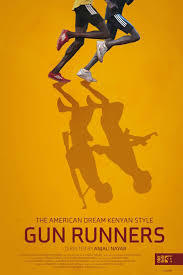 The film is a documentary following Julius Arile and Robert Matanda, two Kenyan cattle farmers and warriors, that we find in 2006, when they decide to compete in the Tegla Loroupe Peace Run, an event offering rural people a chance to change life and pursue a career in sports. All we see in the documentary is from Arile and Matanda own words. They have been using weapons since childhood, as a way of defending their animals and fight against enemy tribes. In this race they can trade his weapons for amnesty and running shoes, and the possibility of taking part in a training program at Peace Camp. Arile wins the race and joins a training program, while Matanda decides to go back to his village, although later, and convinced by Arile, he also trades his gun and try unsuccessfully to get an athletic career. Not as focused or talented as Arile, he abandons the program and get back to his village, where he can be close to his family and help with the farming duties. As Arile keeps his training, he gets his first public appearance giving a speech in the United Nations, in New York, against illegal guns in Africa. Without any important victory, he feels pressure from his family for not being around to take care of his children (he has three wives), or his farming duties, while his economical contribution is sparse. 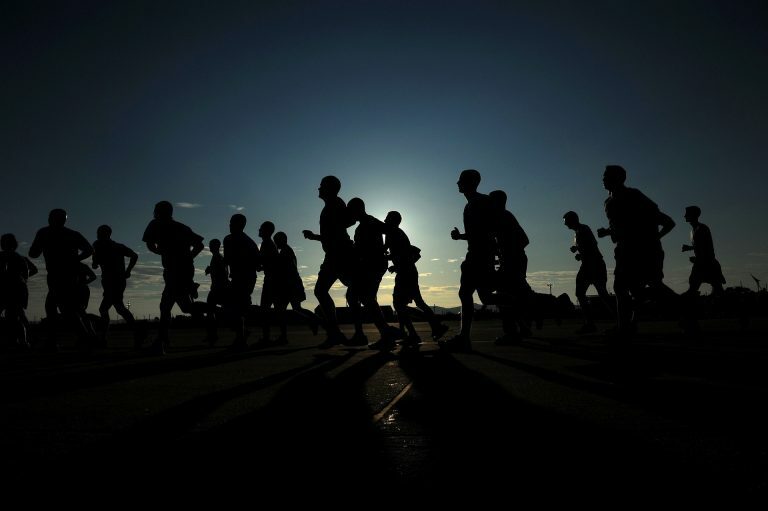 From Peace Camp he moves to Iten, a training camp for elite Kenyan runners, including former world record holders and marathon majors winners, although competition is hard. As chief trainer Zane Branson says, only 1 of 10 will get some money from racing, and only 1 of 50 really get enough money to make a temporary living out of it. Matanda keeps his family life, complaining about the distancing attitude of Arile with his family duties. Arile, suffering from injuries and not in the best conditions, gets his first chance of becoming an elite athlete in the 2013 Prague marathon, although being in the top 3 for a big part of the race, he only manages to finish in seventh place. Matanda enters politics, spending his family resources in supporting a candidate who had promised him a position in the future government. Defeated, he has problems to pay his children school fees, but he manages to do so after harvesting his crops. Meanwhile Arile gets some good positions in races, until finally is invited to run the 2013 New York marathon, a race that had been his main goal since started running. Leading the race early, he manages a meritorious fourth place, with a 25000$ cash price, and finally is received as a hero back in his village. Before credits, we know that Matanda enrolled in college and Arile bought a farm and 20 more cows with his money prize. Sadly, Matanda and his wife died in a car accident just shortly after filming, with his 7 children taken care by Arile´s family and the community. Pros: understand how difficult is for African athletes to get to top level, not only because of the hard competition, but also because of his family conditions back at home. Cons: not enough information of the chronology; that there are more than a half million illegal guns in Kenya. Amsterdam had already tried to host the Olympic Games of 1920 and 1924 before being selected for the 1928 appointment. 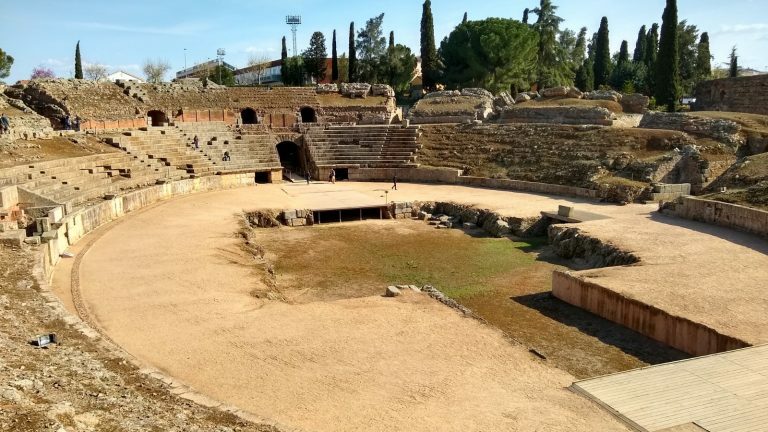 It would be the first appearance of the Olympic flame, and also the first time a 400-metres track was used in athletics. They would see Paavo Nurmi win a ninth gold medal, in the 10000 m, and Germany return to competition after being banned in the last two Olympic occasions. Ahmed Boughera El Ouafi was born in Ouled Djellal, Algeria, when it was a part of France. At a young age he joined the French army, where he was noticed because of his athletic capabilities. 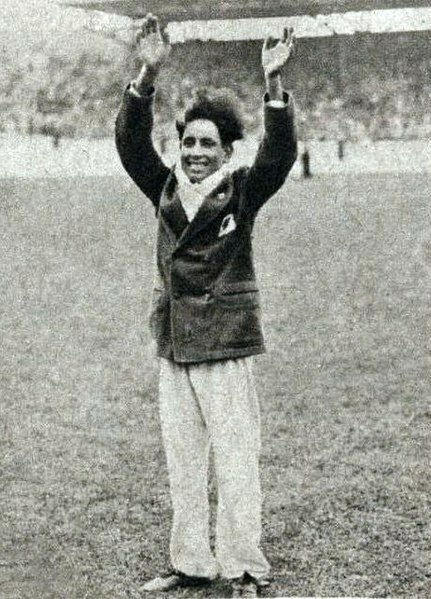 He qualified successfully to run the Olympic marathon of Paris in 1924, where he finished in a promising seventh position. While working for Renault he focused his attention in the next Olympics, to be hold in Amsterdam four years later. In the marathon start line in Amsterdam there was no clear favourite among the 69 runners present. There was no much story until mile 23, when we find a small group leading the race, formed by El Ouafi, running for France, Plaza from Chile, Ray from the United States, Marttelin from Finland and Yamada from Japan. At that point Ray took a brief advantage, although soon neutralised by Yamada. His lead would also be short as he started suffering cramps. At that point El Ouafi and Plaza opened a small gap with Marttelin, before El Ouafi was able to break free shortly before entering the stadium, to win the gold medal in 2.32.57, 26s ahead of Plaza (who improved his sixth position in the Olympics of 1924), with Marttelin completing the podium. 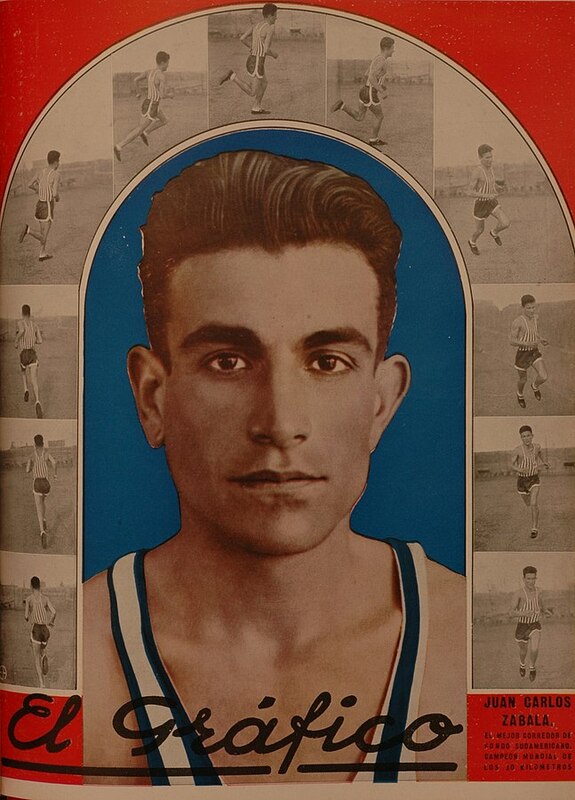 El Ouafi would win the only gold in athletics for France in 1928, and the first one for the African continent. After his victory he toured the United States to race against… animals, only to be excluded on his return from competition by the French Athletics Federation because of his professionalism. With the money he won in this trip, opened a café, although with no much success. He went into oblivion until 1956, when another French-Algerian runner won the Melbourne Olympic marathon, and was found by reporters as a pauper. He would die in a still non-clarified shooting in a café, gaining attention only in recent times, in an effort to restore his athletic achievements defending the colours of France. For a race to be considered ultra-endurance it must last more than 4 hours, although sometimes they are only considered if lasting beyond 6 hours. These races can last for days, or even weeks, with energy requirements as high as 7000 kilocalories per day. A negative energy balance can lead to energy depletion, with a decrease of the levels of body fat and skeletal muscle mass, with sport anaemia, gastrointestinal discomfort and hypohydration also being noted as key factors in the performance. Inadequate nutrition might impair performance, with energy deficit affecting finish times in many ultra-endurance events. For a 24 hours race the decrease of body mass reported was 1.7%, a combination of fat mass, skeletal muscle mass and fluid loss, especially located in the lower trunk. Carbohydrates are usually the main source of energy, with an average of 68% in ultra-endurance events, although their contribution can be modified, especially in cold conditions, like in an 800k Antarctic race, where fat can be contributing a 60% to the energy expenditure and carbohydrates only a 25%. The consumption can go to 90g of carbohydrates per hour of exercise for ultra-endurance athletes, compared with the 60g/h of endurance athletes. The first carbo-loading protocol, aimed to load the body glycogen stores (liver and muscles), was developed in the 1960s. It consisted of a 3-4 days “depletion phase”, with high-intensity exercise and low carbohydrates intake, and a 3-4 days “loading phase”, with low-intensity exercise and high-carbohydrates diet. This classic protocol was later modified to a 6-days period, with progressive increase in the carbohydrates intake accompanied by a decrease in physical activity. This shorter protocol avoided fatigue in the stressful depletion phase. The most recent approach favours the combination of a resting period rest of up to three days with a high carbohydrates diet. In ultra-endurance sports fat is a reliable source of energy. The “fat-adaptation” diets are aimed to increase the oxidation of fatty acids and attenuate glycogen depletion, in what is known as “ketogenic adaptation”. They provide 60-70% of energy from fat, and only a 15-20% from carbohydrates, and are followed for the last 5-10 days before the race. As intensity in these competitions is always sub-maximal the high levels of at would not be detrimental. Amino acids are the building blocks of proteins, and it is still unclear if their consumption has any effect on skeletal muscle damage. On the other side, the intake of more than 2g of protein per kilogram of weight per day didn´t have any influence on physical performance. It is clear that maintaining hydration levels is important to keep aerobic performance. Hypohydration decreases performance, increasing body temperature, heart rate, and the use of carbohydrates as fuel source. Common recommendations for proper hydration, trying to avoid losses over 2% of body mass, are usually suitable for shorter periods of exercise but sometimes inappropriate for ultra-endurance activities, often resulting in hyperhydration. Previous recommendations disqualifying “thirst” as a stimulus “to drink” originated in conditions where hypohydration would develop rapidly, usually in high sweating rates and high intensity exercise. Nowadays the concept of “drinking to thirst” is adequate for ultra-endurance activities, even in hot conditions. Several studies have reported that this level of drinking doesn´t affect negatively performance in comparison with higher volumes of liquid uptake. Excessive fluid intake (overload), or hyperhydration, may be associated with an increase in body mass, total body water, and a decrease in plasma sodium concentrations, a condition called hyponatraemia, which can develop serious complications. The hyponatraemia is common among endurance athletes, with more prevalence in female and slower athletes, and although is present in ultra-running and ultra-swimmimg, is usually absent in ultra-cycling, probably because cyclists can drink from their bottles as they wish. Excessive sodium intake is unnecessary, and potentially harmful. Proper nutrition will delay fatigue and hydration will support body functions, maintaining exercise performance during ultra-endurance events, and by extension in your life.